A three bedroom detached farmhouse in perfectly habitable condition with many storage rooms and land for sale near Sertã, Central Portugal. The house, which is set over two floors, has a footprint of 135 square meters and has a plot of land measuring 3.540 square meters. This property has much potential to be easily converted into a lovely family home with extra space for visitors. The land is a good size to grow most of the necessary vegetables to feed a family. The main entrance to the house is via stone steps at the side of the house leading to a large veranda with good views into the well kept garden and the surrounding landscape. From the main door there is a corridor with a dividing door. To the right there are two doors, one leading into a fully tiled kitchen and the other to a bedroom. The kitchen has wooden base and eye level units and a free standing stove-cooker. To the left, there are also two doors, one leading into a bedroom or office, the second to a partially tiled bathroom with bathtub, toilet, bidet and pedestal sink. The corridor ends at a diving door, which gives access to a living room from which there is a door to the right to another bedroom. Up front there is a door to the master bedroom, which is triple aspect and has french doors to a balcony overlooking the garden to the front of the house. The floors in all these rooms are wood or wood parquet, all are in very good state of repair. The only exception is in the kitchen and the bathroom, where the floors are tiled. The windows in most of the rooms on the first floor are iron framed single glazed, except for the master bedroom, where the windows and shutters are exotic wood and in perfect order of repair. The windows of the other rooms to the front of the house also have exterior shutters. From the large veranda to the side of the house on the first floor there is a large annex space which could easily be converted into more living space and integrated into the rest of the first floor. There are also stone stairs to the attic, which is ample space and could easily be converted into more living space. The ground floor of the house consists of a garage for a tractor and a wine cellar to the rear. To the front there is a living room with tiled floor, a storage room with tiled floor with access to the wine cellar, which has a cement floor, behind it, and a kitchen with fireplace in the corner and a dining space, both with tiled floors. 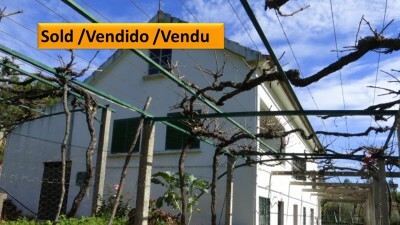 There is a large terrace running the front of the house, in the summer shaded by the vines. The property benefits from a bore hole and a large well and is connected to mains electricity. The land belonging to the property consists of space to grow vegetables, a number of mature fruit trees including a very large lemon tree and around 30 mature and well pruned olive trees and many grape vines. At the end of the land there is a small mixed forest. There is also a garage for one car at the entrance to the land. The property is not overlooked and only has two neighboring houses in sight, each of which is inhabited by an old woman. The property has good access via a tarmac road, and is located on the outskirts of a tranquil hamlet just 5,5 km outside the town of Sertã, or a 10 minute drive from all amenities. The dual carry way IC8 is a mere three km away. Sertã is a beautiful historic town built either side of a stunning river setting. It has many restaurants and bars as well as 3 major supermarkets, banks, schools, library, theatre, cultural center, municipal swimming pool with gymnasium and river beach. There are also two weekly markets, held every Friday, one selling fruit, vegetables and livestock and the other selling clothes, tools, plants, shoes etc. Sertã is easy to access off the IC8 dual carriage way. The closest airport to the property is located at Lisbon, which is approximately two hours´ drive way. Porto airport is slightly further taking approximately two and a half hours. Both Lisbon and Porto airports are serviced by several low cost airlines which operated regular flights into and out of the United Kingdom and other European countries.